Don Delves had a grand idea of opening up the back of his North Shore Chicago house, drawing his classically landscaped back yard into the home. He built a deck across the back and sought replacement windows to bring the sunlight and yard into the back porch. 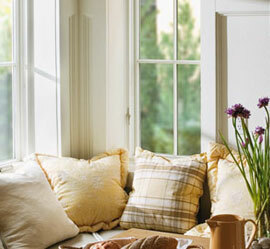 Oftentimes, we visit classic North Shore homes and help them plan how new windows can bring in light or keep out cold. We suggest styles and colors to match an existing home. In the case of the Delves home, we worked with the homeowner to fit into his plan. We found a way to enhance the effect he wanted. We suggested wooden replacement casement windows that accentuated the classic architecture of the home while still brightening the room with plenty of natural light. The windows open up effortlessly to draw in lots of air, a particularly stunning effect as the garden blooms throughout the summer. At the Don’s request, we made sure the color scheme remained flexible. For an older home, wooden windows are often the best choice. We used primed wood, rather than a complete finish, so the homeowner could select a custom color. Our flexibility in product and willingness to enhance an existing plan really improved upon an already beautiful space for the Delves family.